Announced during this weekend's Fanime panel, Crunchyroll's latest addition is none other than the upcoming Sailor Moon Crystal anime. The series is set to kick off on Saturday, July 5 at 3:00am PT. More information to come regarding available territories, along with an official page for the series. 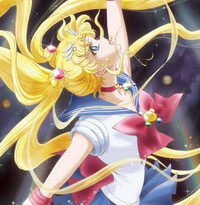 For now, get pumped for some new Sailor Moon! Crunchyroll had a couple more announcements during the panel, including JoJo's Bizarre Adventure Re-Edit, which takes the previous JoJo's TV anime and rearranges it into a 3-episode compilation. JoJo's Bizarre Adventure Re-Edit starts streaming on Friday, May 30 at 12:30pm ET. Finally, there are a couple new live-action Japanese TV series on the way. Frenemy - Rumble of the Rat, which stars two members of EXILE, starts with six episodes set to run on Monday, May 26 at 5:00pm PT. The final six will follow later. Then there's No Dropping Out -Back to School at 35, starting Tuesday, June 3. More information will be coming later on that, as well.